This is part two in a seven part series on finding the right locations. With Ambleton Delight, Itsuka wrote a wonderfully rich screenplay creating a little world of her own in a quintessential and idyllic English village. I will be the first to admit that I was apprehensive and more than a little daunted when it came to recreating this village and bringing it both to life and to screen. 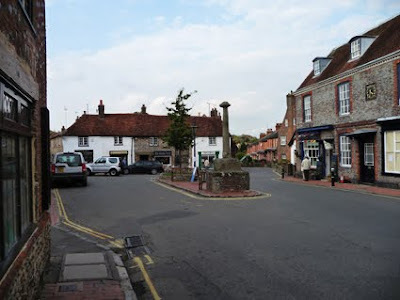 We spent hours driving all over Sussex but to no avail that is until we visited Alfriston. Dan and Itsuka had visited very briefly once when they were writing the script, so it was always at the back of their minds and when we finally made the trip together I could see why. It was perfect and exactly what we were looking for. 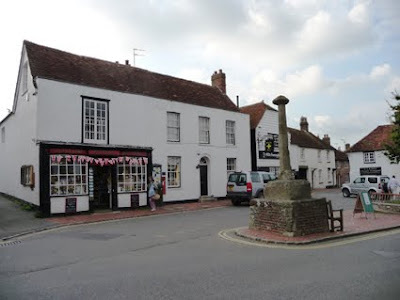 To be honest after all the trips we made and time spent there I grew quite fond of Alfriston. It is a beautiful and picturesque little village and by the end of filming I knew most shop owners and so on by name, was chatting away with the locals and found myself giving directions to tourists on more than one occasion. Cast and crew on the narrow streets of Alfriston village. I would say that one of the advantages of us being from other countries and not “locals” so to speak is that we still haven’t become blind to our everyday surroundings and it is often this fresh eyed approach that works when scouting locations. A disadvantage though is lack of local knowledge of places. That may seem inconsequential to anyone else but it's gold to a filmmaker. Being aware of this I set about making contact with Jilly a local councillor in Alfriston . Dan and I met her one afternoon in the charming Badgers Tea House in Alfriston, and over coffee we proceeded to grill her on all aspects of the village, the people the places and so on. As luck would have it she happens to be a lovely person who has a background in film herself and we immediately hit it off. In the end she was more helpful then I could have hoped she gave me contacts with the local drama group The Alfriston Players who ended up playing our village councillors. When we said we were still looking for a hall, she suggested the village hall in Littlington as a possibility. This was a God send at the time as it was a location that was proving almost impossible to find So we immediately checked it out and it turned out to be just exactly what we were looking for. So in short, when filming in somewhere unfamiliar don’t underestimate the wealth of knowledge locals have, it can prove to be invaluable. 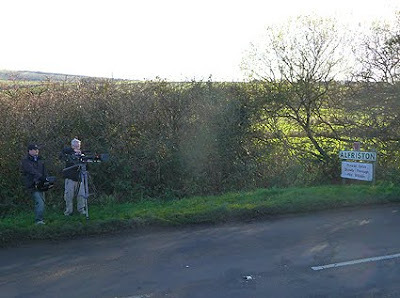 filming the village sign (which was digitally changed to the Ambleton sign).